It seems like DVC raised the price of one-time points to $19 from $17 within the past couple of days. Second price increase within 2 years. Holy cow! I thought they were still $15. The $2 raise to $17 passed me by. I make use of them every now and then. Wow!!! Thanks for posting. I’m honestly shocked they did this now since they just increased it to $17pp a few months ago. Wow! Glad I purchased the extra that I needed last week at $17 per point. 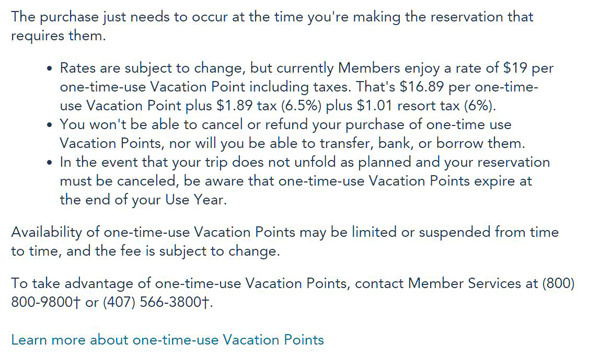 This reinforces to me that, other than with distressed points, MO points should never be rented for less than $20, especially outside the 7 month window when Disney is charging us $19 for those same 7-month points. Wow, did not know this, glad I purchased mine a couple of weeks ago for my next trip. Did not see any notice about this coming. I would think any points rented outside of Disney should be for less given the risks involved. If I have a choice of renting one-time points from Disney to cover a reservation gap for $19 or have an MO transfer for the same price, I'm going with Disney. Much easier and safer. And yes, I've transferred and rented from MO members before so I'm cool with the process. But if it's a choice of $19 to get it done now or $19 to find a willing person, wait a few days to sort through the details etc., I'm going with the path of least resistance. For larger rentals, I would never pay more than a broker charges. Of course, my goal is to manage my points so I don't have to do either! To add on, if you are getting 10 one time points and Disney is $3/pt higher, you are talking $30. Not worth the risk...also, it doesn't count against your transfers in the event you want to leave open the option to do one. I see your point, and agree that for a small rental that could be completed through Disney's OTUP, I would go that route myself, even if I could get the points from a member for less. I'm referring to those who are not owners, do not have an option to purchase OTUP or to have points transferred in. Brokers pricing should be aligned to Disney's valuation for a OTUP, which then means that renters through brokers would also pay $19 per point within the 7 month window, and more per point if 7-11 months out. Maybe I have this view because I bought in after the recession, and because I am always able to use the points that I won't rent for less than $20 apiece.